I think I got 12 mosquito bites the night Joshua and I ate at The Capri. It was our last night in Marfa, Texas and neither of us were looking forward to leaving behind such a significant little town. There's a specific kind of quiet that only exists in the middle of nowhere, a penetrating quiet that goes beyond just a lack of highway traffic or chatty tourists, and settles into your bones, shifting the way you think, feel, and move. It makes the days seem longer, the air more fresh, and already-delicious food and drink more memorable. And both of us noticed it the second we arrived. I had heard about Marfa a few years back, probably just after Beyoncé visited and made the city an "it girl" get-away vacation spot. But my experience there was almost nothing like I expected. It wasn't trendy bar after trendy bar filled with hip artists, filmmakers, and musicians. It wasn't food trucks with a line down the block for the best tacos in Texas. It was quiet, secluded, almost strange. Restaurants stay open until they feel like closing, many of them only open a few days a week. The streets are seemingly abandoned, a car or small group of people passing through every once in awhile. And while the city didn't meet my expectations, it exceeded them in a way I never could have imagined. Marfa is just as incredible as everyone says it is, not because it's "cool", but because it's remarkable, peculiar, special. That last night after dinner we sat outside for a few hours, sipping on craft cocktails, while I ignored Joshua's request that we move inside; although he had zero mosquito bites, I was welcoming new ones every few minutes. And while the next day in the car I sat with my hands in my lap, unsuccessfully willing the itching to stop, it didn't matter. Those pesky bites eventually go away, but Marfa doesn't. It stays with you, in your bones, until you eventually hop in the car and make your way back. What's more American than picking fresh blueberries on Fourth of July weekend, you ask? 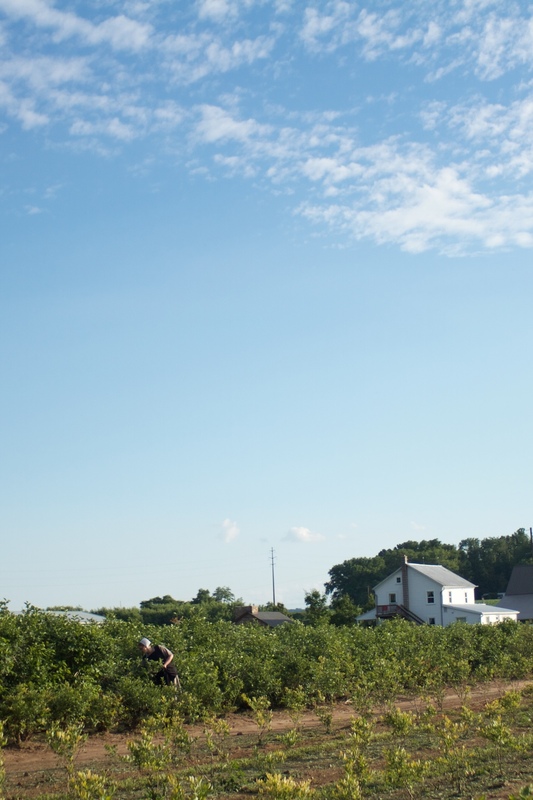 This past Friday Joshua and I went with his parents to the Green Barn Berry Farm in Muncy, Pennsylvania and spent a warm, Summer evening picking blueberries. I've since decided to move away from New York City and live on a farm, where I can grow fresh fruits, veggies and herbs in my backyard, spend mornings sipping coffee on my front porch, and store my clothing in a closet instead of on a clothing rack in the middle of my apartment (wait, other people in New York have closets? oh...). While I was picking (read: eating) blueberries I spent some time playing with my new camera. After almost 5 years with my trusty little Canon Rebel t3i - my very first DSLR - I finally upgraded to a Canon 7D and haven't put it down since. Two nights ago Joshua's mom made a delicious blueberry pie to kick off our Independence Day celebrations, and I think later this month I'll take a stab at my very first homemade blueberry jelly. But first, if anyone has a farm they aren't using just let me know. I'll be there in 5 minutes. It's my last semester as a full time student and I could not be happier to leave 5 classes a week and an endless barrage of assignments in the past. In the months leading up to an inevitably busy summer I've been trying to take time for myself, but sometimes mornings of meditation and evenings of eating Cookie Butter ice cream (so gooooood) and watching New Girl aren't quite enough. Sometimes the peace and quiet of living in a cozy studio apartment is interrupted by 18-wheelers barreling down the street outside and construction workers ripping out the cabinets of the apartment next door at 8:30 in the morning. Sometimes the only way to get a little rest is by leaving the city. A few weeks ago Joshua and I were perusing Escape Brooklyn to find a place to escape Manhattan for Spring Break. After pining over disappointingly expensive A-Frame cabins and boutique hotels, he found the perfect, affordable, refreshing getaway: Spruceton Inn. A self-described Bed and Bar, Spruceton Inn has been open for about a year and a half, and seems to have perfected the modern-day inn experience. Owners Casey and Steven remodeled the old motel (formerly owned by Arnold Schwarzenegger 's brother, Karl) in 2013, and have been living out my dream life scenario ever since. Books and board games in Room One. The bar at Conan's Corner. The inn - a 2 1/2 hour drive from the city - has 9 simply decorated, rest-encouraging rooms, a fire pit, charcoal grills, and is a 15-minute walk to the nearest hiking trails. They also host a handful of artists and writers each year as a part of their artist residency program (as if this place couldn't get any better...). In Room One of the inn - dubbed Conan's Corner - you'll find the bar: coffee bar by morning, actual bar by night (why this isn't how every bar works is inconceivable). The bar serves Cafe Grumpy coffee, craft beer, whiskeys, wine, and happiness. In here you'll also find decks of cards, books written and illustrated by Casey's husband and co-owner, Steven, and a little tiny wifi signal - perfect for one of those automatic "out of the office" response emails. Although I had originally planned to catch up on all of my writing, emailing, and school work while we were out of the city, I quickly learned what an rare opportunity I had with 4 days and almost no wifi: I could finally relax. The first day we took a four-hour hike that quickly showed me how out of shape I was (or is walking and talking difficult for everyone?). We made it to the top of Hunter Mountain where we climbed a terrifyingly rickety fire watch tower to catch incredible views of the Hudson Valley. That night we spent the evening at Conan's Corner, sipping on wine and whiskey and talking to a couple of other New York City locals and Columbia graduate students who were also trying to escape for a few days. Our second day was a day of writing and spontaneous driving that lead us to Phoenicia Diner (an upcoming post! ), a place we read about on too many "must do" lists to ignore. And that night we (mostly Joshua...) grilled burgers on one of the charcoal grills outside, following about ten rounds of a card game (ah, life without the internet). Most New Yorkers know that a 4-day vacation is just short enough for your return trip to be a begrudging one, and this was no different. Although a sad drive away from Spruceton Inn, with no longer an excuse for unanswered emails, I left knowing that, like a former guest of the building, I'll be back. What to do with a single day in Nashville and about $11 left in your pocket? Spend the whole day at coffee shops. Take a look at a few of spots Joshua and I stopped by in an last-minute attempt at a pre-semester vacation. We walked into a crowded shop filled with tables covered in laptops, notebooks, and half-drunk cups of coffee. Less than a mile from Vanderbilt University, Dose Coffee seems like a college-student study spot, and I understand why. Big windows along one side of the shop let in plenty of natural light to remedy an afternoon of essay-writing, and with Counter Culture coffee behind the bar students can count on a quality cappuccino to get them through the semester. And any place with tee shirts that say "Uno. Dose. Tres." is okay in my book. On the recommendation of a bartender at Bar Luca (a place that makes you feel cool even if you've been sitting in a car for 10 hours) we stopped by Revelator Coffee, and, like the proud tourists we were, left with a bag of beans, a cup of coffee, and a Revelator brand Swell water bottle. Roasting out of Birmingham, Alabama Revelator is quickly making waves in Southern coffee culture. Fingers crossed it heads up here to New York because as much as I'd like to I can't be driving to Nashville every weekend for a new bag of their beans. I just can't. Although we stopped by to pick up a bag of coffee beans, the freshness of the shop's design made it very tempting to spend our entire afternoon sitting in one of the open booths along the wall, sipping on a macchiato while taking Instagram pictures of everything. Located in Nashville's Germantown neighborhood, Steadfast Coffee boasts a spacious interior, with a large patio for afternoons when Blizzard Jonas isn't dropping a foot of snow on the city. After a chat with a knowledgable and friendly barista we decided on a bag of Peru, and brewed on a V60 back home in New York, the beans didn't disappoint. The past two trips to Nashville we've stopped by Barista Parlor's East Nashville and Golden Sound locations. But after spending the past few months gawking at Instagram photos of their newest location in Germantown we finally had a chance to visit. The fresh space is filled with natural light and accented with shades of olive green and bold orange, a contrast to the clean lines and crisp white brick of the building itself. At this point in the afternoon we were about 4 cups of coffee in so I opted for the Irish Whisker, a delicious drink made with coffee, cream, orange zest, a Whiskey reduction, and magic. It’s no secret that the third wave coffee movement has made an impact on cafe culture in New York; with an abundance of coffee shops popping up around the city, New Yorkers seem to have their pick when it comes to carefully crafted cappuccinos. But three hours away, in Williamsport, Pennsylvania, the craft coffee culture is quietly making waves of it’s own. Owner and Head Roaster, Jesse Darrow with his son, Timbre. The Sawhorse Cafe, owned by husband-and-wife team Jesse and Hannah Darrow, opened it's doors in April of 2015 and has since become a Williamsport favorite. 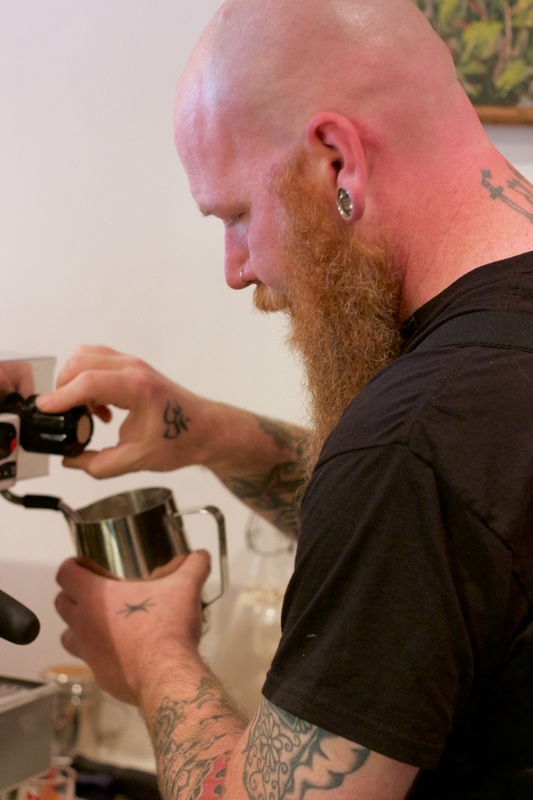 The cafe serves farm-to-table eats, homemade pastries, and Buzzsaw Coffee, roasted in-house. My boyfriend Joshua (a former Williamsportian…Williamsporter?) and I stopped by for a bite to eat and a chat with his friend Jesse. When we met up with Jesse he was roasting coffee in the back office, holding his less-than-a-year-old son, Timbre, in his left arm while sorting through the freshly roasted beans, picking the burnt ones out of the batch, with his right (so let’s just put that whole “men can’t multitask” thing to bed right here). Growing up Jesse always loved food and farming - a passion that’s evident in his approach to the cafe’s ever-changing menu. They source their ingredients locally, allowing the menu to shift with the seasons and reflect the Central Pennsylvania region. Jesse’s approach to coffee is similar: find the best beans he can and don’t mess them up, roasting lightly to highlight the work that nature and the farmers have already done. In the coffee world there seems to be the perception that a roaster with success in a larger city has higher quality beans, but that’s not always the case. 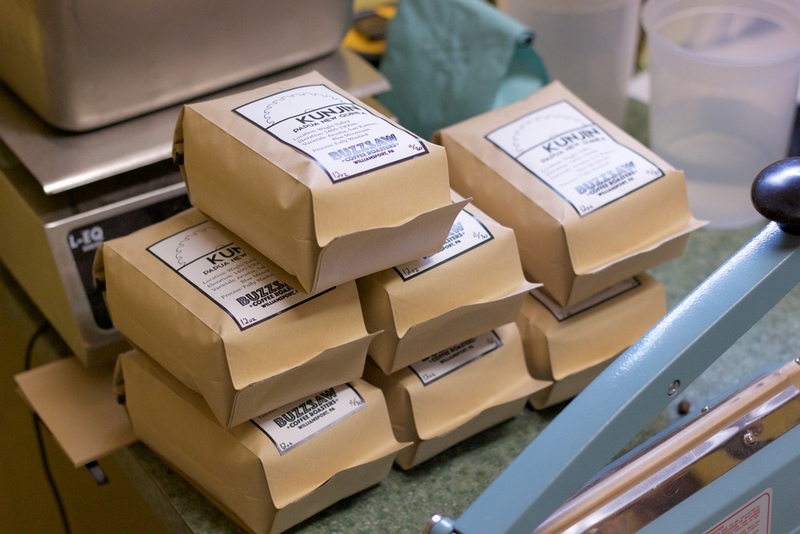 Roasting out of cities like Portland, Chicago, Los Angeles, and San Francisco, heavy-hitters like Stumptown, Intelligentsia, Counter Culture, and Blue Bottle often get more attention in mainstream coffee conversations, but more and more often quality micro-roasters are popping up in places like Williamsport. In Pennsylvania alone Square One (Lancaster), Alabaster (Williamsport), and Passenger (Lancaster) have already gained traction; and in nearby Ithaca, NY Gimme! Coffee has established a presence in New York City, proving that these smaller roasters can hold their own. Having worked as a sales rep for Gimme! Coffee and as the head roaster at Alabaster - where he took their beans far in the America's Best Espresso competition - Jesse understands this industry well. And through Sawhorse Cafe he hopes for Buzzsaw to continue to grow, and ultimately develop into it's own entity. When it comes to the cafe itself, the space is bright, open, about three times the size of any shop in Manhattan, and very Instagrammable. Offering Kalita Wave pour-overs and espresso drinks on a shiny La Marzocco espresso machine (also Instagrammable), Jesse and the baristas take great care in using brew methods that compliment their coffee beans. 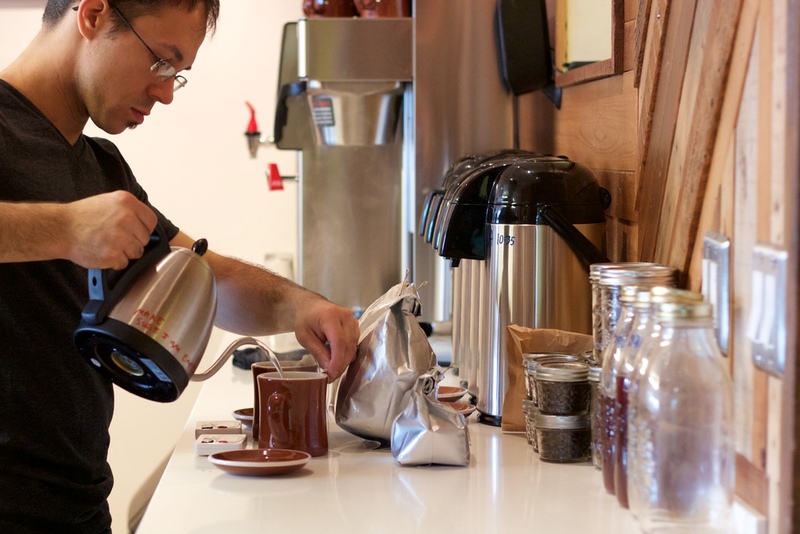 If you're lucky enough to live nearby, stop in for a quality cup of coffee at a community-focused cafe. And for those of us in New York, the three hour drive is probably a faster commute than trying to maneuver the L train during rush hour. If we're being honest. New York City. The city that never sleeps. One of the most incredible places to live, and also one of the most exhausting. After living in New York for just over a year I've learned just how valuable even a few hours outside of the city can be. Taking a break from the fast-paced lifestyle, the constant noise, and the multitasking required to get anything done in a timely manner is a necessity in order to maintain any kind of sanity. In an attempt to find a few moments of peace and remember what exactly trees look like, I took a trip to Bear Mountain State Park last Monday. If you're looking for an easy escape from city life for a day or two, read on for a few places we stopped at along the way! What is the exact opposite of riding the subway? Hiking. Although we missed the color-changing trees by what seemed like a few minutes, the fresh air and lack of ambulance sirens made the hike a welcome break. The ground was covered in layers of crunchy, golden leaves, the sky was clear, and there were zero bears, which always makes for a better hiking experience in my opinion. About a 55-minute drive outside of the city, a trip to Bear Mountain is a great escape from the brick, concrete, and homeless people that New Yorkers are typically surrounded by. *And if driving isn't an option Coach offers round-trip bus tickets to the park for only $26. With only an hour left of sunlight, and not enough time to start a new trail before dark, we did a quick Google search to find a town nearby to wander around before dinner. The results: Sleepy Hollow (which, to be completely honest, I had no idea was in New York...). Once the sun went down it was time for our last stop before begrudgingly coming back to the city. We stopped by Peekskill Brewery on the recommendation of a friend and quickly learned there's nothing better than an unnecessarily large burger and a cold, chocolatey stout at the end of a busy day. Just a short walk from the Peekskill Metro North station and only about an hour outside of the city, the experience is definitely worth the trek. Not only will you sit down without the fear of bumping elbows with strangers at the neighboring table - a novelty for New York residents - but you'll also have the opportunity to indulge in some of the best mac-and-cheese you'll probably ever encounter (and I'm pretty picky about my mac-and-cheese). Overall my first, and fairly last-minute, day trip out of NY was a success. I came back to the city feeling refreshed and sane, two very good things to feel.